The analogue and RPM inputs are factory fitted optional features of the VIDEO4 and have been specified at the time of ordering. If the analogue and RPM inputs are fitted to the VIDEO4, then the analogue inputs can be used to log data from external sensors, for example you can connect these inputs to temperature and pressure sensors. 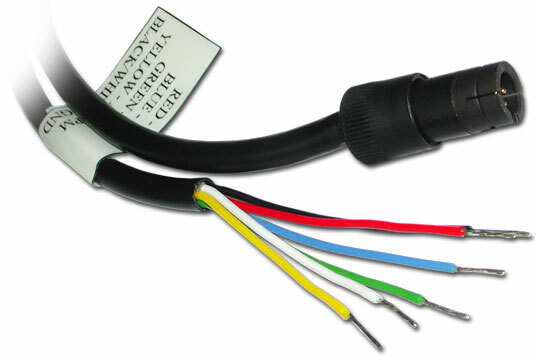 These inputs accept a voltage in the range of 0 to 5v, making them compatible with all standard Race Technology sensors. The RPM input accepts a �low level signal�, that nominally goes between 0 and 12v, this is typical of the type of signal that comes from an ECU. If it�s required to connect to a �high level signal�, for example from an ignition coil then it is essential to use an RPM conditioner, more details are available about this here. For general information about connecting RPM and where to take a signal from, there is more information here. For general information about connecting analogue sensors from other manufactures, please read the information here. 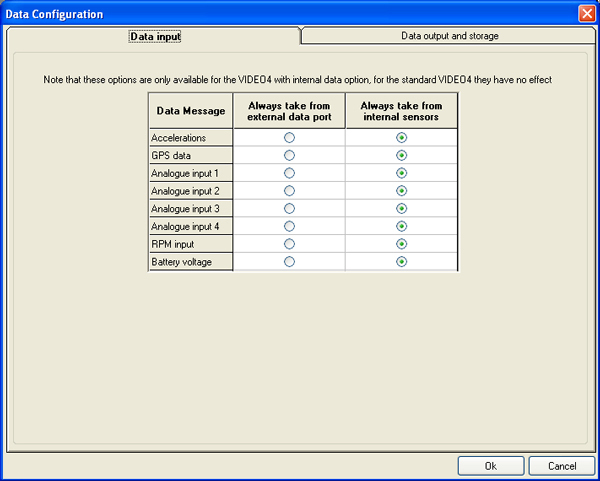 By default the VIDEO4 will take data from it�s external sensors when it is available, however in some more specialist configurations it might be required to configure where data is taken from. 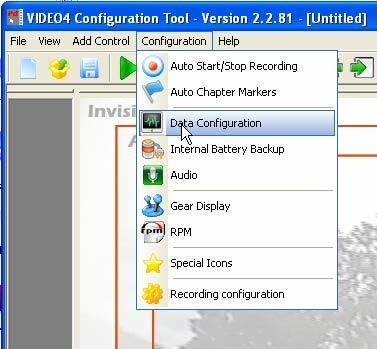 This configuration is set in the �VIDEO4 Configuration Tool�, the �Configuration� -> �Data Configuration� menu. There are 2 options that are available here. The normal option is to take data from the internal sensors, however as an alternative you can force the VIDEO4 to take the data from the external data port. A typical application of this might be if you want to take RPM from an ECU adapter, instead of the built in RPM input. Very important: This regulator is only suitable for supplying a relatively small amount of current to our sensors and is rated at a maximum of 100mA. The �voltage and temps� switch controls all voltage and temperature channels. If this is left as �internal sensors� then it will record the VIDEO4 internal box temperature, as well as its input voltage and battery voltage when available.